Hi friends, welcome to SolidWorks tutorials for beginners guide and in this tutorial, I am going to show you how to use SolidWorks spline sketch tool in CAD for creating complex curves. This is very basic how to tutorial, showing how to use this tool for sketch two or more pointed curves and also explains the spline property manager for controlling spline curve point co-ordinates, angle, relations etc. Below you can see about spline curve basics and how to use it in step-by-step SolidWorks CAD screenshots. What is SolidWorks Spline Sketch Tool? SolidWorks Spline is a sketch tool used to sketch or draw spline (curves) on the sketch graphics area. This sketch tool helps you to add spline points and join line between them. After that you can adjust the spline point positions, curve angles etc. Spline sketching tool is mainly used to create curves simple as well as complex. For creating a simple curve draw two spine points and adjust the line curvature as your requirement. You can use both mouse pointer and spline property manager to adjust tangent weighting, x-y co-ordinate positions and tangent radial angle. Checkout Best SolidWorks Training Materials here. Main applications of SolidWorks spline sketching tool is that helps to create complex parts, easy to design products from the pictures, used for sweep boss or sweep cut feature applications, create complex structures etc. 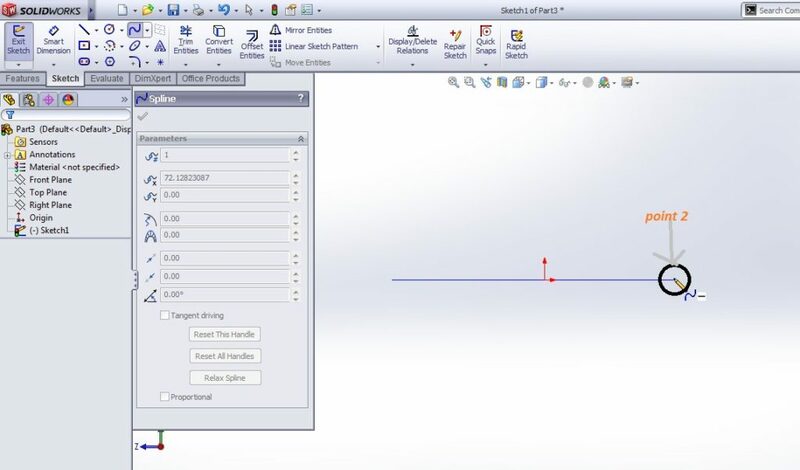 Let us see SolidWorks step-by-step tutorial for using spline tool. How to Use SolidWorks Spline Sketch Tool? Here, I am going to show you how to create simple curve using the spline tool and also explains the spline property manager too. Go to Sketch command manager and click on the Spline button like as shown in the below screenshot. Move your mouse pointer to Menubar and Click on “Tools Menu”. From drop down menu, select “Sketch Entities” and click on the “Spline” from the appearing side drop down menu. Now, your mouse pointer is changed to sketch pencil with spline on its suffix. First, click on the right plane or origin to create first spline point. Then, move to right or left direction and click on plane to create second spline point. You can see a straight line. To make it to simple curve you need one more spline point between the 1st and 2nd spline points. First, select the spline curve as sketched in the plane and go to “tools menu”; select “Spline tools” from the drop down menu and click on the “insert spline points”. Then it will create spline point between two of points a shown in below screenshot. Like that, you can add Tangency control, Curve control, simplify curve, show curve handles, show curve combs etc. Simplify curve helps to smoothen the curve by deleting the intermediate spline points and apply tolerance for curve simplification. The curvature combs enables to give idea about the curve smoothing and it helps to adjust the points for getting fine curves. This way you can create simple spline curves using the SolidWorks spline sketch tool. Wait for my upcoming SolidWorks tutorials for advanced uses of spline sketching tool. Existing Relations: it shows the exiting relation between two splines lines or curves. Add Relations: It helps to add new relation such as coincident or tangency between another sketch profile and a spline curve. Options: It contains options such as for construction, show curvature and maintain internal continuity. It contains parameters such as Spline point number, X co-ordinate, Y co-ordinate, Tangent weighting 1, Tangent weighting 2, Tangent radial direction, tangent driving, relax spline, reset the handle etc. Spline point number: It indicates that the each spline points and automatically give numbers to them. For editing positions and tangent radial direction angle, just select the number of the point and do it from the spline property manager. X-Y co-ordinate: Indicates the x-Y positions of the each select spline point number. Tangent weighting 1 & 2: It indicates the tangent handles positions for a selected spline point. Tangent Radial Direction: It is angle between the tangent handles and imaginary horizontal line (X axis). You are awesome! This is the best tutorial on this tool that I have seen!